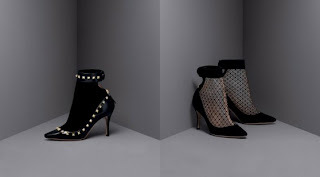 Valentino offers us images of fabulous footwear styles from the pre-fall collection 2012/2013, an exclusive and precious value that comes back to classical forms, however embellished by elements of character as the studs. Since Valentino did a few seasons of the studs on the center of his lines, I just think the whole collection Rockstud characterized by these metal inserts glam rock flavor, a demonstration of how a famous brand in the world for its style and its elegance can also aim to conquer fashion different areas. The new collection of shoes by Valentino the established forms and reinterprets them in a decidedly new and interesting keys. In fact, fabulous dancers come out of the preview images in black paint that recall the shape of a retro slippers with gold heels, coordinated with the great pyramid studs on the toe. The return of the lace for women, with their mood masculine softened by the presence of a short heel gilded. But to characterize the collection as always on high heels stiletto sandals are especially charming and pumps. The models are designed more eccentric pony with zebra print along the upper that covers the heel and toe peep-toe, but are also supplemented by lists and strap around the ankle embellished with metal studs and smaller. Heels by a zigzag profile decolletes characterize a narrow point dall'allure usually more refined, combined with the equally amazing bags of the winter collection. Beautiful new ankle boot then, that mimic the profile of a decolletes with inner sock and are designed in black leather or suede with medium or high heels, and the internal network ended a collar around the ankle, in many cases from the mythical path studs . Sandals in neutral tones are proposed as the powder with broad heel and obvious feature of the metal inserts that cover not only lists and strap, but the heel itself, making the shoe impossible to pass unnoticed! While the line of ankle boot is characterized by the choice of frills and ruffles along the upper, with coordinated with the bags, or for the shape-toe cap that isolates the tip by thinking in metal than the rest of the upper leather. Rounding off the collection, the piece de resistance: biker boots! In practice the kind of model that we hardly imagine the jaws associated with Valentino! Yet here they are, available in black leather with gold string and zip sides to complete the form!